The espresso black Bose Wave Music System IV can produce high-quality sound from your CDs, AM/FM audio, and external music sources. This system features Bose's Waveguide technology, which is engineered to produce enveloping sound. This technology is enabled by two internal folded waveguides that combine to deliver high-quality performance from a compact, newly-redesigned speaker cabinet. With this system's front-mounted, single-disc CD player, you can expand your listening options with MP3 file support. Its digital AM/FM tuner allows you to listen to free over-the-air content. There's even a headphone output onboard for personal listening. Additionally, the Bose Wave Music System IV can also serve as an alarm clock complete with snooze functionality. The Wave Music System IV has a touch-sensitive control under the top, front, center area of the top panel. Momentarily placing your hand on the touch pad can turn your Wave SoundTouch music system on or off, snooze a sounding alarm, and reset it for the next day. The rear Bose link easily connects your Wave system to a compatible Bose Lifestyle system for an expanded home entertainment network. A slim infrared remote lets you conveniently control all system functions. You can instantly access your favorite stations with six FM and six AM presets. The Wave Music System IV features a large visual display with song and station information, plus adjustable brightness and automatic night time dimming. Box Dimensions (LxWxH) 19.0 x 12.9 x 7.2"
Wave Music System IV (Espresso Black) is rated 4.1 out of 5 by 190. Rated 5 out of 5 by Pastenseverv from Bose does it again. This is my second soundtouch system and it's better than the first one (a soundtouch 20). Of course the sound is everything you would expect from Bose but the features on this system are spectacular. i use the soundtouch software mainly and control both systems with the app. The Bluetooth feature and the availability of a CD player is a bonus. My wife hates any light at night and I discovered you can set the display to be completely dimed when the lights go off and goes back to normal when they come on. Set up was fast and easy and works well with the Soundtouch software. My only complaint would be the software could be a little more user friendly. Rated 5 out of 5 by 1809 Oakridge from Best sound ever We own 2 soundlink 10 which are linked together by Bluetooth and we play them all the time. We have owned Bose products since the early 90's and will not buy anything else. The sound is beyond explanation for a out of the box product and have never had a single issue. If someone is having issues they should call the help line or at the very least read the directions. We list our first wave radio due to a lighting strike and replaced it before the insurance adjuster arrived, we cannot be without our Bose sound in the house. Keep up the great work as the world would be a very quiet and boring place without your wonderful product. Rated 2 out of 5 by Jimbob from Good sound, but not Great; Very Poor bluetooth I bought this model last year hoping to improve the music sound in my kitchen. It is very good, but for the price I paid, I would have been much better off with a less expensive system. The most frustrating thing about it is the bluetooth. I rarely can connect to my Galaxy S8. I have followed all the help ideas, updated the firmware on both devices, cleared all devices, re-paired, etc. To make matters worse, recently I was playing a CD on the Bose and my daughter's laptop upstairs kept taking over the Bose via Bluetooth and stopping the CD. She wasn't even in the house! That was just plain crazy. Would not buy again at full price. Rated 5 out of 5 by Ernie from Great System I bought the Wave SoundTouch IV a week ago replacing a Wave I I've had for some time. I also have a Wave III with a 4 CD player. I wanted the SoundTouch to be able to access internet radio and music apps such as Pandora via Wi-fi. I set it up and had it working in less than an hour. I am totally satisfied with the product as I can now pull my music collection from my PC, listen to virtually any radio station and use my Pandora subscription. My wife got the Wave III for her sewing room so everyone's happy. I'm now looking at the SoundTouch 10 for a different room. If looking for a quality wi-fi music system, buy this product, you won't be disappointed. Rated 5 out of 5 by Dane from Best music system I have ever owned I've had Wave radio systems for at least 20 years. The first one I owned only had a radio (buttons were on top). I still use it in my bedrom. The second system I owned had the built-in CD player (buttons still on top). I gave that one to my 10 year old son and he has it in his bedroom. Then I got the Wave with the SoundTouch. This was a game-changer for sure. I use Internet Radio, i Heart Radio, and Pandora and the sound is phenomenal! All controlled from my i-Phone, it is far and away the best purchase in a music system I have ever made. I have gotten so used to the SoundTouch, I will never be able to do without it. And the sleek design fits so well with my furniture. I am looking to expand the system into other rooms. Rated 4 out of 5 by Jemgal from Love my Bose but not the remote! This is our second Bose Wave Music System. The first one lasted 15 years, although the CD player quit years ago. The sound is fantastic but having to rely on the remote is NOT. This system is used as our alarm clock for my husband and I. Unfortunately since the buttons have been removed from the top we have to rely on the remote when we need to change the alarm times, which is often. It's a pain for both of us. It is a sleeker design but we're into functionality and the older model was a great design. If it's not broken don't fix it... the old design wasn't broken! Still love it for the sound quality. Rated 5 out of 5 by MRFLASHPORT from Outstanding system with superb sound, easy to use Replaced a 11 year old Bose Wave CD as I wanted to add the ability to use Bluetooth audio. Glad I did. While my original Wave CD still goes strong, the Wave IV is a huge upgrade. Nice to see a tone alarm clock, and top mounted on/off tap feature. Where it really stands out is the network capability. OBE (out of box experience) is painless. In about 5-10 minutes you can be on your home network streaming your own library, or everything on your phone/tablet. Having the CD player is nice for those of us who still have piles of CDs. It's well made, sounds superb, and you won't spend half a weekend configuring overly complex setup menus or wiring anything. It will just work the first time and every time. 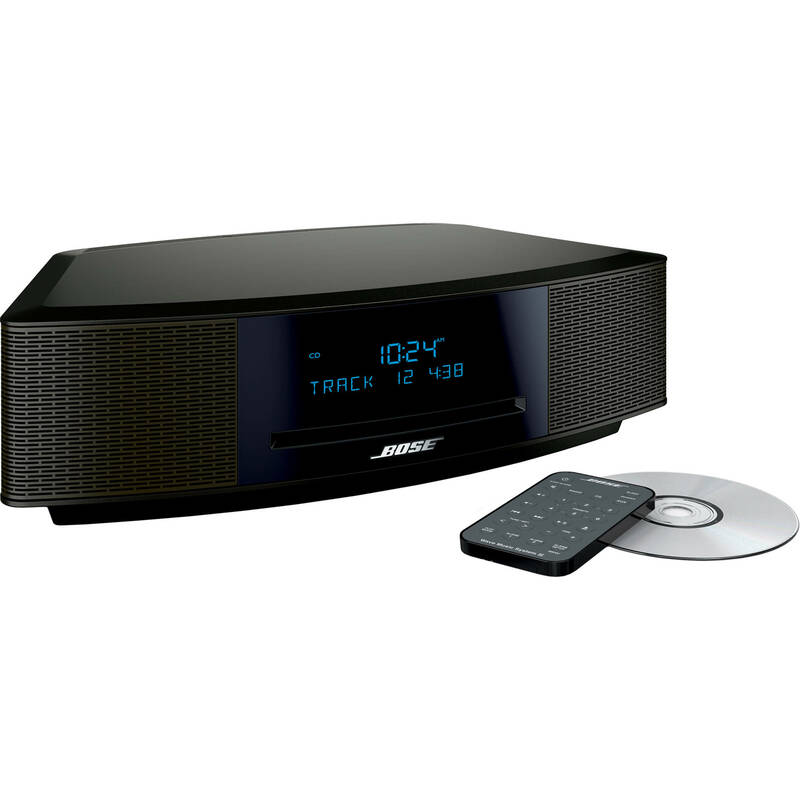 What is the difference between the Bose Wave Music System III and the Bose Wave Music System IV? For the IV, Bose simply updated the design. Only cosmetic changes this time. It's the same radio underneath. With the all-black front, it looks more modern. will my iPod play through this with an aux cable? If your iPod will play on your car stereo with an aux cable, then probably. I was under the impression that Apple products don't use standard cables. Can this transmit to other speakers via Bluetooth if I would like to add on speakers ? There is no bluetooth connectivity offered by this device. I understand this does not have Bluetooth in the unit .How would I get this to receive Bluetooth ?Does this play mp3 cds ? 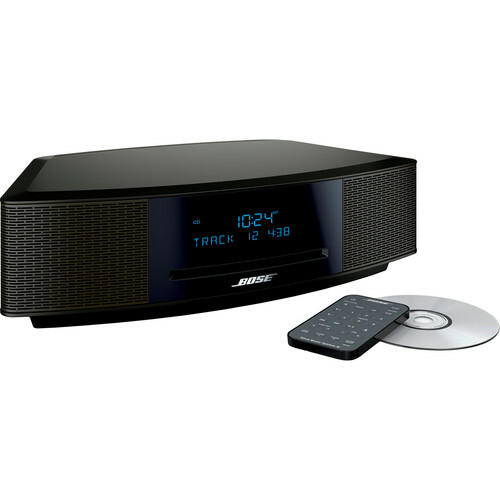 an I purchase the Bose music system over the counter anywhere? How about Palm Springs, CA.? Is the Bose Wave IV 220V instrument? No - it is a 110V AC 60 Hz device only. I would like to know the weight &amp; measurement for shipping.? I have an extra WiFi device like the one that comes with, sits under and attaches to the Wave Sound Touch Music System IV to allow for Pandora, Sirius, etc. Can I attach that device to the Wave System IV and effectively turn it into another Wave Sound Touch Music System IV? As per the Bose web site, you can wireless (WiFi)connect the Wave 4 radio to your favorite web streaming service . Based on that I would say you can.